To temporarily hide the mess around your desk or to simply use as a privacy screen. This beautiful folding screen features 3 solid wood frames with raised panels. 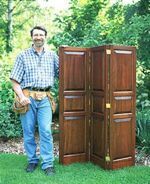 With a quality set of router bits, you could easily build this project.